The Imperial seems like a pretty big name for a fairly small space on a somewhat hidden corner of Decatur, but the clever design seems to make a big deal out of just that fact. It even opened early with a limited menu to feed locals who were going stir crazy after being confined to quarters thanks to the big snow and ice storm that hit Atlanta in late January 2014. Besides wings and things, Trivia is promised. The Imperial is off to a good, convivial start. The Imperial, 726 W. College Ave., Decatur, GA 30030, 404-464-5698. After 17 years on Ponce de Leon Avenue, The Righteous Room has stepped out into the near ’burbs and opened a spot in Brookhaven. Fans of the famed late-night spot will find the same menu right down to the vegetarian chili and the terrific burger, available to the wee hours. This branch of The Righteous Room is open for lunch and dinner and is open late. The original is located at 1051 Ponce de Leon Ave. NE, at N. Highland Ave., Plaza Theatre shopping center, 404-874-0939. Lunch & Dinner daily. The Righteous Room, Old Five Points Shopping Center, 2142 Johnson Ferry Rd. NE, Atlanta, GA 30319, 770-559-5678. Ian Mendelsohn, former beverage director for The St. Regis Atlanta, and his wife Susan have opened Vine & Tap, a wine and brews bar in Buckhead. Zeb Stevenson, formerly with Livingston Restaurant + Bar and now executive chef at PARISH Foods & Goods, consulted on the menu, which offers a raft of small plates and tapas of Mediterranean culinary inspiration. No liquor is served, so the focus is entirely wine and brews. Mendelsohn has the right background for such a project, having served as sommelier everywhere from Windows on the World to The Mirage in Las Vegas before coming to the St. Regis. He promises to draw his wines from small producers from around the world. At least two taps will be devoted to local brews, Monday Night and SweetWater. Vine & Tap, 2770 Lenox Rd. NE, Atlanta, GA 30324, 404-600-5820. Chefs Shaun Doty and Lance Gummere opened a second Bantam + Biddyon January 21, 2014. 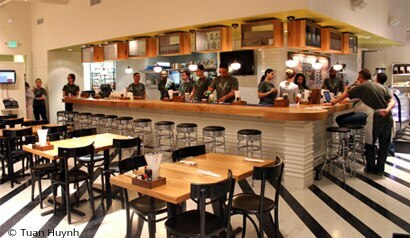 The newest location of the fast-casual concept is in the heart of Midtown on Crescent Avenue, and makes the third restaurant from the duo; the other two are Bantam + Biddy in Ansley Mall and Chick-a-Biddy in Atlantic Station. In addition to offering the same regional and pasture-raised poultry and organic, seasonal vegetables as at the other two establishments, the new restaurant has a caffeinated bonus: an espresso bar serving Batdorf & Bronson coffee. Farm-raised eggs from a local source, gluten-free offerings, meatloaf made from White Oak Pastures beef from near Albany, Ga., and sustainably raised pork are all part of the pair’s philosophy. A kids’ menu for children 10 and under also focuses on healthy fare. Bantam + Biddy, 1050 Crescent Ave. NE, Atlanta, GA 30309, 404-835-6450. St. Cecilia by Atlanta restaurateur Ford Fry has opened, replacing Buckhead Life Restaurant Group’s BluePointe in Buckhead’s Pinnacle Building across from Lenox Square and Phipps Plaza. Seating 160 patrons, the restaurant is the design work of The Meyer Davis Studio. The massive, light-filled 11,000-square-foot space features a second floor private room that holds a hidden flat-screen TV. Playful, European beach-inspired photographs line the walls. Downstairs, three stone chef’s tables together seat 12 in front of the icy crudo bar. Continuing the hearth-centered cooking of King + Duke, which Fry opened in 2013, a roaring, mini-hearth visible in the shiny stainless steel open kitchen roasts the fish of the day. For more information, visit stceciliaatl.com or call 404-554-9995. Lunch Mon.-Fri., Dinner nightly. St. Cecilia, Pinnacle Building, 3455 Peachtree Rd. NE, Atlanta, GA 30326, 404-554-9995. Rosebud has decided to eliminate lunch service Monday through Thursday, but announced a Friday full bunch menu available from 10 a.m. to 3:30 p.m. Citing the need for a little "downtime," Rosebud continues brunch on the weekends, now beginning on both Saturday and Sunday at 9 a.m. The restaurant's popular peekytoe crab cakes, as well as some other "lunch" focused entrées, will be brought over to the brunch menu. Daily dinner service will begin at 5 p.m. instead of 5:30 p.m. and the bar opens at 4 p.m. Rosebud, 1397 N. Highland Ave. NE, Atlanta, GA 30306, 404-347-9747. Ru San's in the Clear Creek Shopping Center on Piedmont Road at Monroe Drive was sold, closed and underwent a substantial renovation. Now reopened, the restaurant offers a huge menu that includes a page of "Midtown Specialties" as well as some very traditional Japanese dishes. Noodles, tonkatsu and gyoza are among the dishes that flesh out the myriad sushi offerings. Customers clamored for the return of the lunch buffet, and it was re-launched January 16. Lunch & Dinner daily. Ru San's, Clear Creek Shopping Center, 1529 Piedmont Rd. NE, Atlanta, GA 30324, 404-875-7042. Full-service weekend brunch (Sat.-Sun. 11 a.m.-3 p.m.) has begun at No 246 Restaurant in Decatur. A new daily lunch menu is also available. Among the new dishes are Creste rigate al forno with meat gravy, pequin chilies and Grana Padano cheese; lumache (shell pasta) with fennel sausage, ancho pepper, rapini, roasted garlic and pecorino; pineapple pizza with prosciutto, mozzarella and Calabrian peppers; and Springer Mountain chicken with Mercier apple, celery root and sherry bacon agro dolce. The restaurant has acquired a new pasta extruder, and is eager to show off what the team can do with it. No 246 Restaurant is now staying open until midnight on weekends. At the bar, $6 all-you-can-eat margherita and salami pizze and the full bar menu of cocktails, wines and beers are the draw. No 246 Restaurant, 129 E. Ponce de Leon Ave., Decatur, GA 30030, 678-399-8246. Cyrille Holota departed BLT Steak for an assignment in Bora Bora after years of working in Atlanta, first at Joël then at FAB downtown. As he departs, BLT’s general manager Nick Alicea took over the kitchen assignment. The New York City native just happens to be a classically-trained French chef with 20 years’ experience in the industry. He went front of the house about seven years ago and has roamed the planet studying and gaining experience. He has been with InterContinental Hotels Group as an assistant food and beverage director, and with the Dolce Group was the general manager of several properties. Wearing multiple hats seems to be no problem for Alicea, who will wear both general manager and top toque lids at Atlanta’s BLT Steak. BLT Steak, W Atlanta Downtown, 45 Ivan Allen Jr. Blvd. NW, Atlanta, GA 30308, 404-577-7601. Atlantans often find themselves in Nashville, for business or pleasure. So many of its denizens will be interested to know of an important change at the city's highly regarded restaurant, The Catbird Seat. Its founding chefs, Josh Habiger and Erik Anderson, left their posts in July and December 2013, respectively. Anderson returned to Minneapolis, while Habiger remained with The Catbird Seat’s ownership, Strategic Hospitality, to take charge of Pinewood Social, opened in December 2013, as well as future projects. Strategic Hospitality cast a wide net to find a replacement, and has now announced the restaurant's new executive chef: former Noma sous chef Trevor Moran. The two-year-old Nashville restaurant zoomed to national notoriety under Habiger and Anderson, leaving Moran some big toques to fill. But coming from Noma gives him major credibility for the role. The Catbird Seat, 1171 Division St., Nashville, TN 37203, 615-810-8200.